World Cup winner Matuidi bagged the decisive goal on 58 minutes after Croatia’s Mandzukic, a finalist in Moscow this summer, had scored after just two minutes in Emilia Romagna. New Parma signing Gervinho — back in Italy after two years with Chinese club Hebei China Fortune — pulled one back after 33 minutes for the hosts who have returned to the top flight after three consecutive promotions following demotion for bankruptcy in 2015. 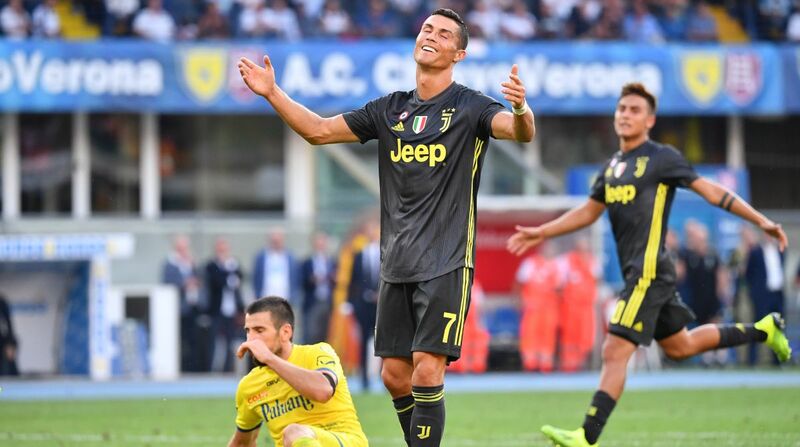 Ronaldo is yet to score but the seven-time reigning Italian champions are on maximum points after winning all three of their games this season. The 33-year-old five-time Ballon d’Or winner missed a chance to open his account after 26 minutes when his powerful header was just wide, and spurned another chance ten minutes into the second half. “Cristiano had a good game, he made himself available, but it was a moment when the ball did not bounce back in the right direction,” coach Massimiliano Allegri told streaming broadcaster DAZN. Allegri said he was impressed with Mandzukic who has scored twice in the opening three games and set up Matuidi for the winner. “I didn’t expect Mario to be in this condition after the World Cup,” he added. Earlier Radja Nainggolan scored on his debut as Inter Milan claimed their first three points of the season with a 3-0 win in Bologna. Nainggolan missed the first two games of the campaign with injury following his summer move from Roma. But the 30-year-old Belgian midfielder made his mark on his league debut, opening his and Inter’s account at the Stadio Dall’Ara after 66 minutes. Italy midfielder Antonio Candreva and Croatia’s World Cup runner-up Ivan Perisic added two quickfire goals in the final ten minutes to seal all three points. The win gives Luciano Spalletti’s side four points from three games, equal with Roma who lost 2-1 at AC Milan on Friday. Filippo Inzaghi’s Bologna are stuck on one point, without a single goal scored in three games. “We were patient because there was a risk of starting to panic,” said Spalletti. “There were three beautiful goals and the team shook off the tension after the opener. Inter captain and striker Mauro Icardi tried, unsuccessfully, to shake off a muscle strain by warming up before being forced to watch from the stands, along with Lautaro Martinez. It left Keita Balde as Inter’s sole striker, but with Nainggolan, Matteo Politano and Perisic in support. Perisic nodded into the side-netting early with Roberto Gagliardini also firing over for the visitors before Bologna threatened, Filip Helander’s header cleared off the line by Inter goalkeeper Samir Handanovic. Nainggolan missed a chance to open the scoring just before the break with a powerful half-volley from the edge of the box flying over. But the Belgian made no mistake after the break, controlling Politano’s cross to fire past his former Roma teammate Lukasz Skorupski. Candreva replaced Keita on 79 minutes and three minutes later turned in a low cross from Perisic for his first goal in over 18 months before the Croatian sealed victory two minutes later. Serie A while runners-up Napoli play Sampdoria in Genoa on Sunday, looking for a third straight win.